eatingclub vancouver: Duck Shepherd's Pie, or "Duck Coop Pie"
I think we had this idea to make duck shepherd's pie from when we had the first duck, but we already had that all planned out, so all those dishes overshadowed this idea. 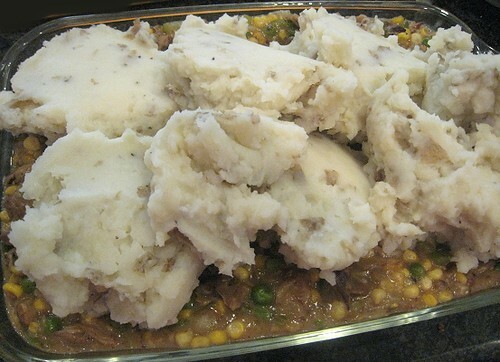 Besides, prolific as that single duck may have seemed, we didn't think it was enough to make shepherd's pie. 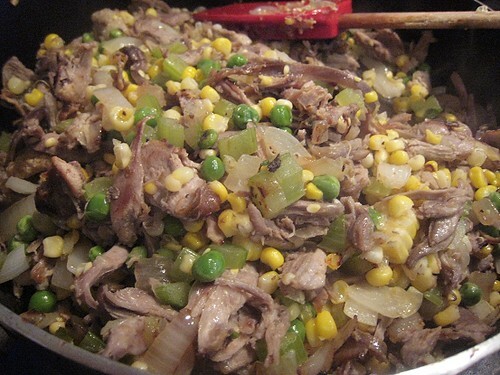 Actually, if lamb makes shepherd's pie and beef makes cottage pie, what does duck make? I'll christen this dish Coop Pie. I'll go and trademark that. After a bit of time after our first duck, JS bought two ducks. The two duckies were both used for this dish. Of course, before we could make my Duck Coop Pie, we did the requisite rendering of the fat, making of the broth and shredding of the meat. 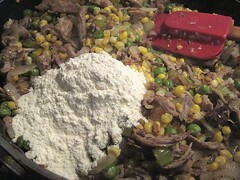 Then, I turned to the Joy of Cooking for a shepherd's pie recipe and gathered that the filling simply calls for cooking some vegetables and meat in broth, then thickening with flour. OK, then. I put the book away. I was ready. 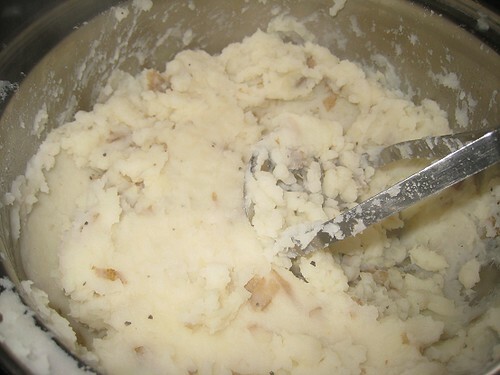 But first, the mashed potatoes. I boiled some potatoes; we had russets on hand. I didn't bother peeling them. When they were done, I drained them and proceeded to mash. I used some duck broth and duck fat, but actually, most of the liquid I used was simply the water in which the potatoes were cooked. Our cupboards were practically bare when I decided to make this, but I was too lazy to go out and buy anything. 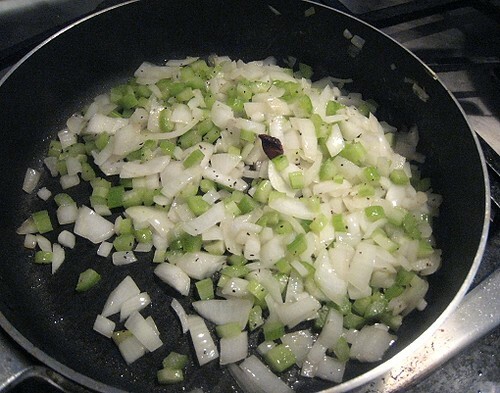 So, for my aromatics, it was just some onions and celery (carrots too, if we had them). That weird nubby thing in the middle is a star anise arm. I figure I'd add it for a certain je ne sais quoi. 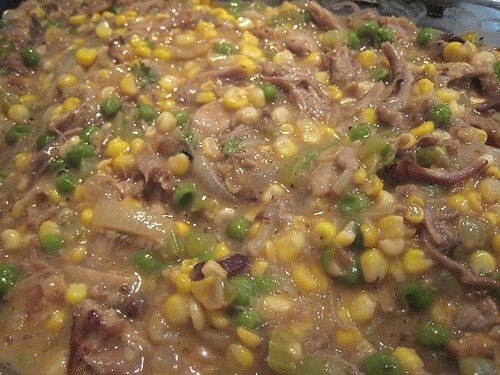 After letting them soften, I added my shredded duck meat, then frozen peas and corn. After heating them through, I added duck broth and let it boil for a little bit. The flour went in next. 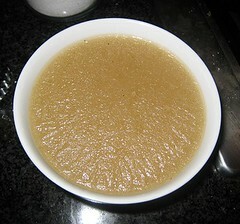 I let the mixture cook until it thickened. 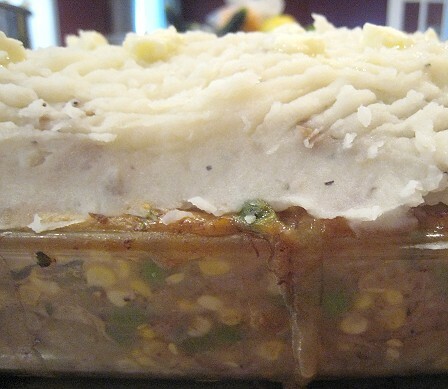 The filling went into a glass baking pan, topped with the mashed potatoes. I didn't know what kind of pattern to do for the mashed potato top, so I ended up with this weirdo-abstract one. I also debated whether or not to do the dotting-with-mini-pats-of-butter technique for the top. As you can see, the butter won. Into the oven: 350F for about __ minutes, until the filling was hot and bubbling. I had the foresight to put the pan on a cookie sheet. Smart. See that filling spilling over? This Duck Coop Pie was superb! 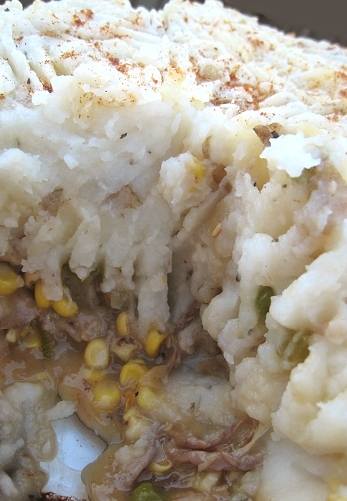 The filling was super flavorful; one needed only a little to flavor a whole mass of mashed potatoes. Good thing I made that mashed potato layer really thick. The filling was really ever-so-flavourful and the duck shone through all of the mashed potatoes on top. The mashed potatoes were so light and fluffy that I felt the dish wouldn't have suffered if there were even more mashed potatoes. I guess this is one way to stretch food dollars. As with our other duck dish (tortellini in brodo), the coop pie tasted very "Chinese," very familiar that our parents -- who normally would not eat shepherd's or cottage pie -- liked it. Or perhaps they just didn't have any choice, given that it was one of those lean days for us when there's only one thing on the table. This particular day, it was only the duck coop pie. Our parents did go for seconds and thirds, so they must have enjoyed the pie. And the children like it too, so this one's a winner. 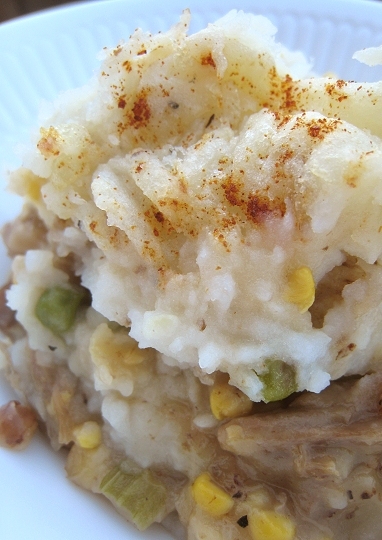 I'm loving the name of your duck coop pie and the thick layer of mashed taters! If the parents love it, then you know it must be good! Looks like a delicious one-dish filling meal! :) Funny name too! 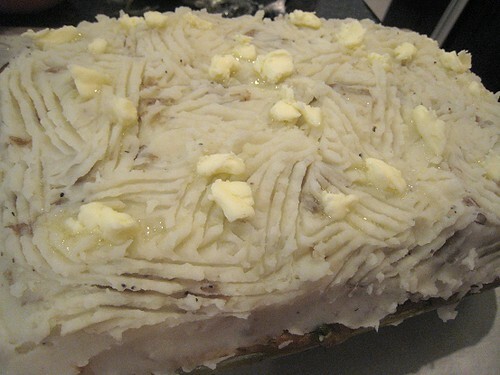 Shepards' pie is a favorite in this house, the fact that I can make it with duck sounds even better. My goal is to cook with duck some this fall, thanks for the inspiration. love the name. and, really, how brilliantly cheap. 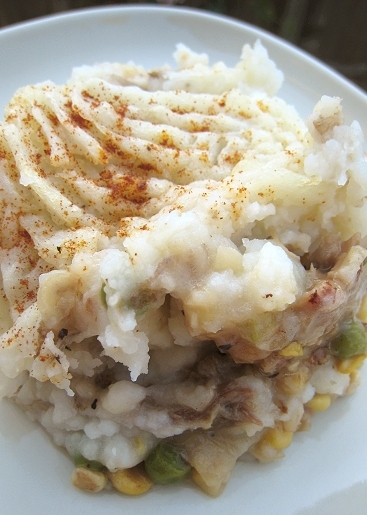 This looks great, and I don't even like shepherd's pie! I like the addition of the star anise - it adds a great flavor that takes this dish beyond the traditional. This looks fabulous! Love the site. Oh boy does that ever look good. Pure comfort food that is! I love a good sherherd's pie. It's all in that one dish, so nice!! 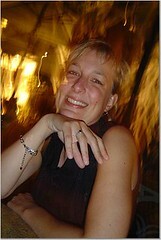 Great Photos again! I never heard of Duck Shepperd Pie before but I would taste it because it looks good & comfort food. Perfect for a cool Fall night. A very creative use of duck..I'll have a corner piece please. 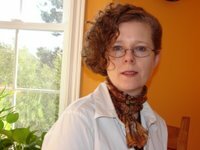 amazed by your creativity, and the endless unique dishes you can whip up with duck! a really good take on meat and potato top pie - that filling looks filling too! Great name for it! Looks delicious. The additional knobs of butter made me smile. I love adding butter to just about anything! That looks sooo good. 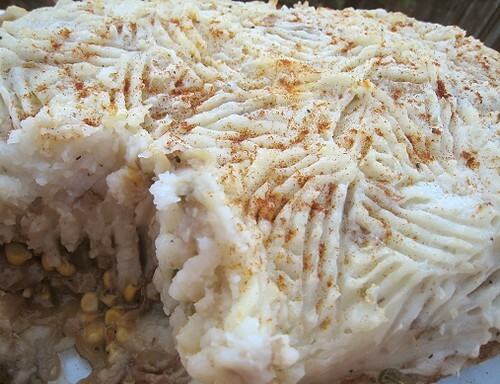 I have not had shepherd's pie in a while and now I am craving duck coop pie! Well, I love all the potatoes in there! Yummy! What's not to love about this - this looks great! Really! That pie looks really good. Duck is on my list of things to try cooking with. I think I'm going to stick with this name from now on, heheh. Maybe the BBQ places in HK have all monopolized the ducks! Or, do people just BUY duck there (ie, eat duck outside) or do they cook duck at home?! We'd love to see your version. All poultry-based "shepherd's" pies should henceforth be called Coop Pie. Yes, very cheap if we get rid of the notion of having big duck breasts to eat. Haha, yeah, I guess those do look like chicken scratches. I must have been subconsciously inspired by the word "coop" and its chicken associations. That's pretty good, actually. It lends a more "adventurous" air to the dish. I hope you find a cheapo one like ours! I think the well (of creativity) may be running dry pretty soon, teehee, at least in terms of duck. Ah, butter always gives a warm fuzzy feeling. Thanky. Must give credit to the duck -- so many ways to use it. Haha, yes, of course, fellow potato ho! We made this extra potato-intensive. I want this too! Been a long time since I have had sherperd pie. OMG this looks amazing!!! I have never seen duck used like this before. Great, great stuff. Mmmmmm... was in Paris in November, and at Domaine De Lintillac, which is basically an "all duck, all the time" restaurant, (with the Woman in The Hat, who's never met a (cooked) duck she didn't like) they featured a Duck Shepherd's Pie, on the French menu as "Parmentier De Canard". Wonderful, though fewer veggies and even more butter and duck fat, I suspect, than this verson.